Never been so easy to share files between your Mac and your iPhone. Or our iPad, or even your iPod Touch. Because it is compatible with virtually all Apple iDevices. With Instashare, a new free application, we may share any file between our iDevices easily (just by selecting the file in question.) No records or format restrictions. 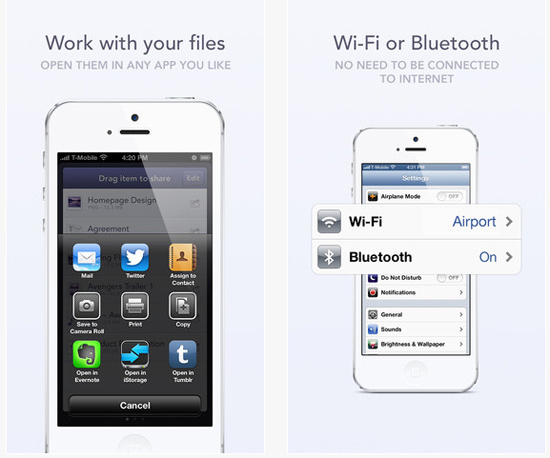 Only we download the application and select the file you want to transfer from one device to another. Most surprising is that neither requires registration anywhere, nor are there any restrictions on the format that we will share, nor will we stick to when using our 3G. Works with any Wi-Fi or Bluetooth. The truth is that it is very easy to use and productive. If you are interested in downloading to iPhone, iPad or iPod Touch, Utilize the link to the App Store below. And if you want to install on your Mac, do it from here . totally free and in English for now.